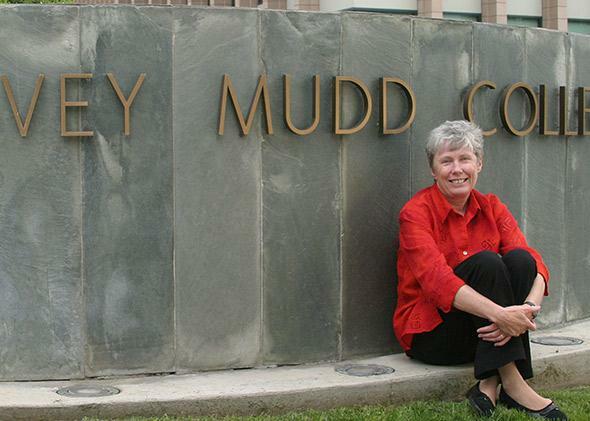 Imposter syndrome: How the president of Harvey Mudd College copes. The female president of Harvey Mudd College on how women in STEM can cope with feeling like they don’t belong. Maria Klawe, president of Harvey Mudd College. This article is part of Future Tense, a collaboration among Arizona State University, the New America Foundation, and Slate. On Thursday, March 27, Future Tense and New America’s Breadwinning and Caregiving Program will host From Nowhere to Nobels: Pathways to Success for Women in STEM in Washington, D.C. For more information and to RSVP, visit the New America website. In the mid-’70s, I was a graduate student at the University of Alberta and attended my first mathematics conference. It was a special two-day session on the geometry of Banach spaces—truly fascinating stuff. Each speaker talked for 20 minutes followed by a 10-minute break when everyone in the (mostly male) audience chatted. Everyone except me because I knew no one—and worse, I was convinced that everyone could tell that I didn’t belong. The second morning I arrived determined to speak to someone during the first break. To my amazement, when I initiated the conversation, everyone started including me and asking me questions. Problem solved—except that feeling has showed up again and again in my life, even as I’ve continued to experience career success. Impostor syndrome is the frequent feeling of not deserving one’s success, and of being of a failure despite a sustained record of achievements. Highly successful people often experience it throughout their careers, especially when they are members of a group that is underrepresented in their profession—such as female scientists or engineers. In every job I’ve had in the last 25 years, I’ve been the first woman to hold my position—head of computer science and dean of science at the University of British Columbia, dean of engineering at Princeton, and now president of Harvey Mudd College. As my career progressed, so did the intensity of my feelings of failure. Now I wake up most days with a voice on the left side of my head telling me what an incredible failure I am. But the voice on the right side tells me that I can change the world—and I try to pay more attention to it. My life goal in changing the world is to make the culture of science and engineering supportive of everyone with interest, ability, and willingness to work hard, independent of race, gender, sexual orientation, other interests, or anything else. For that to happen, we need more women, people of color, poets, artists, ballroom dancers, and football players to enter, succeed, and persist in all areas of science and engineering. The field I’ve spent the most time on is computer science, partly because it, together with mathematics, is my discipline, and partly because it’s the only area of science and engineering where participation by women has significantly decreased during the last 30 years. I’ve been giving talks about strategies for increasing the participation of women in computing and technology careers for a long time. Sometime in the mid-’90s I started including information on the impostor syndrome. The first time I did, a very successful computer scientist in her 30s came up to me after the talk to thank me—she thought she was the only person who felt that kind of gnawing self-doubt. As a dean at UBC and Princeton and as president at HMC, I have started each academic year by telling the first-year students about impostor syndrome, since I know many of them will have times when they wonder whether they belong and whether they are as talented as the other students around them. I also give them advice on how to cope with impostoritis: Ask for help and take it, recognize that such feelings are common and are often connected to high degrees of success, surround yourself with people who encourage you, share your feelings with others, celebrate your successes, be willing to try new approaches if your usual one isn’t working, and don’t let your fears stop you from giving your best effort. Last fall at our convocation ceremony, I asked the Mudd first-year students to raise their hands if they already had had some doubts about whether our admission staff had made a mistake in admitting them. Well over half raised their hands. Afterward, a female senior student thanked me for talking about the impostor syndrome each year—because, she said, every year she felt like an impostor at Mudd. And of course she is doing just fine. Perhaps my favorite experience involving impostor syndrome was the impostor panel at the 2010 Grace Hopper Celebration of Women in Computing. “Hopper” is an annual conference run by the Anita Borg Institute for Women and Technology (this year it will be in Phoenix from Oct. 8–11), that brings together about 3,000 women (and 50-100 men) at different stages in technology careers, ranging from high school students to some of the most senior female leaders. A few months before the deadline for submitting a proposal, Kori Inkpen Quinn, a former Ph.D. student of mine, contacted me to suggest that we organize an impostor panel. Her idea was to have five well-known female computer scientists talk about what makes them feel like an impostor and how they deal with it. I thought it was a great idea—and given how many female leaders in computer science have the syndrome, it was easy to find three others to join Kori and me on the panel. Each of us prepared a few slides in a common format: one with your impostor career highlights (mine started with serving on the Broadcom and Microsoft corporate boards, followed by my academic positions and leadership roles in various professional societies); one with what has made you feel like an impostor and when (for me it was eating restaurants in the ’70s, riding in taxis and staying in nice hotels in the ’80s, giving a press conference and meeting CEOs in the ’90s, and meeting billionaires in the aughts); followed by a slide on ways you cope with impostoritis (mine were “practice, practice, practice,” “surround myself with support,” and “look back as well as ahead”). The panel was a huge success. Every seat was filled as well as every inch of floor space, and the doorways were crammed with people trying to listen from the hallways. The presentations were simultaneously hilarious and inspirational. Since then, impostor panels have been held at many other conferences and universities. They are so easy to organize and have such an impact on the audience. A few months ago a male manager in his late 20s contacted me after hearing me talk about the impostor syndrome. He wanted to talk about how he could help a particularly talented female employee stop feeling like an impostor. In my experience, few people manage to cure themselves of imposter syndrome—it’s usually a condition for life. But given the right mentoring and encouragement, most are able to stop it from derailing or diminishing their success. And perhaps the most important encouragement comes from the knowledge of how many people, both male and female, have had highly successful careers while regularly coping with impostoritis. That intense feeling of not belonging returned last week when to my great surprise I was No. 17 on Fortune’s list of the “World’s Greatest Leaders.” Of course I was thrilled to see Harvey Mudd College get such great recognition for our success in getting 40 percent of our computer science majors to be female, but I know when I’m really an impostor. On March 27, Maria Klawe spoke at From Nowhere to Nobels: Pathways to Success for Women in STEM, an event co-sponsored by Future Tense and the New America Foundation’s Breadwinning and Caregiving program.